Beki Cook's Cake Blog: What?! Your Freezer Doesn't Look Like This? What?! Your Freezer Doesn't Look Like This? Okay, my freezer doesn't usually have 9 cakes and 2-3 dozen cupcakes in it. (Not to mention the tucked-back bags full of cake scraps to be used for cake pops...) But I do love my freezer. I fit this "baking thing" in around many other activities in my life. So, when I have some bad bananas, I bake a banana cake (top right). I know I'll need it eventually. And when I have too much batter from a cake, cupcakes or whatever, I make cupcakes (far left) or mini cupcakes (top center). I sometimes bake cakes for friends. When this photo was taken, I had two birthdays in the same week, with a total of 8 cakes to bake. So, some of those cakes were baked ahead of time and frozen. I highly recommend making use of your own freezer space. When a cake is cooled completely, I wrap it twice in plastic wrap, then set it on a flat plate or on the cooling grid inside the freezer until it's frozen. Once fully frozen, you can move the cakes around to sit on their sides or whatever you need to make the space work. It's so nice to know that I have two banana cakes in there right now, one 6", one 8"... just waiting for me to do something with them! I have a cake and some extra cake crumbs ready for cake pops ready to be used in my freezer also. 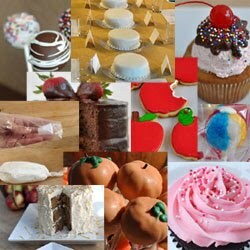 I'll probably be making some cupcakes here tonight or tomorrow for later use. Do you know if finished cake pops freeze well? Or do they dry out or crack when frozen? I haven't actually frozen them completed myself. But I'm told by a friend that she did it and they worked out just fine. Good Luck!